Can't really understand all of this even with a translation...but I think they could be saying he is the child of a police? Corporate Security Int. Squad Aruba C.S.I. Squad ARUBA provides highly trained and experienced armed and unarmed security officers and security teams. Based on the security needs of our clients, all officers can perform patrols utilizing foot, bicycles Quadrace (A.T.V) , marked or unmarked vehicles. C.S.I. Squad ARUBA provides a single point of contact and the ability for consolidated invoicing for all locations. Our customized security solutions include providing officers in uniform or plain clothes, 24 hours a day and 7 days a week. C.S.I. Squad ARUBA uniform options are specific to your requirements. Your security officers make a powerful first impression and choosing the right uniform can be an important representation of your company. All uniforms that require identification are clearly discernible with identification badges and C.S.I. Squad ARUBA logos. Uniforms can be presented in different styles, such as: Bike Patrol Business Casual Executive Military Regular Wear Customized C.S.I. Squad ARUBA achieves the highest level of quality control by utilizing effective screening and hiring policies. This is executed through regular training and testing. All C.S.I. Squad Aruba personnel are subject to thorough background checks, drug testing, and must also meet current state requirements for training and licensing. We provide ongoing training programs for all levels of staff. Training for C.S.I. Squad ARUBA is determined by the location of the assignment and is completed by the employee prior to assignment at the location(s). Training courses include classroom instruction on general orders and site specific post orders, operational and emergency procedures, use of security equipment, defensive tactics and interpersonal skills. C.S.I. Squad ARUBA management is available to our clients, 24 hours a day, 7 days a week. (297) 7401000 Supervisors make scheduled and unscheduled visits to ensure that our staff provides the highest level of service available in the industry. PROUD TO BE ARUBIAN WHEN WORKING PROTECTING STRANGERS WORLDWIDE. Maybe because they're "corrupt as hell"? I have been away, not by choice, but by necessity. I'm very close to achieving a very BIG goal, but that darn world language set me back a few months. I will let you all know once I get the letter. Natalee Holloway & all of you Monkey's inspired this monkey to take matters into his own hands, in order to create change where he could. I do this, not only for myself, but also to help carry on Natalee Holloway's compassion for others. My contributions have already created change in the state of Washington. Obviously solely not my contribution, but I worked tirelessly for what I believe is right in terms of choice and equality, which also helped the state of Washington have an 81% voter turnout. Natalee Holloway helped me finally choose to do what my passion has always been, which is helping to create change where I think it needs to occur. I will always be thankful, that after a few posts, I was welcomed into a very special group of people(monkeys). Randomly looking up something on Natalee Holloway, many years ago, brought me to this place that I could never have imagined. 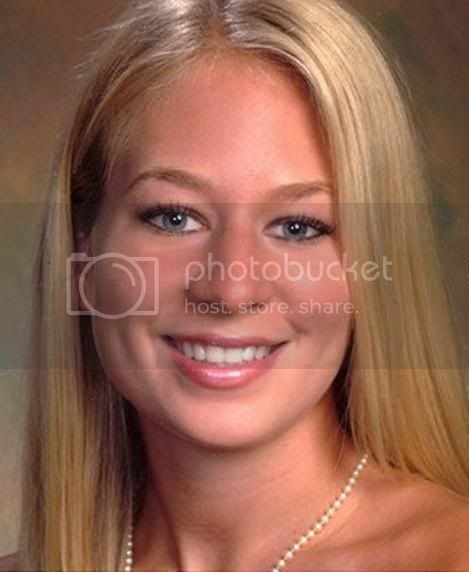 Natalee Holloway's door on the planet earth may have closed, but by doing so, she opened a million other doors for people who will carry her memory on for years to come. Let me emphasize, her door on earth closed, but a very special door opened to the gates of Heaven where her compassion can be better served to touch humanity as a whole. I believe, because I'm living proof of that touch. May we continue to open the door that was closed on her, by touching others lives, so their doors open up. Goodnight & God Bless! I see that grace-land has already posted about this while I was waiting for the nightly timewarp to be over. But since I went to the trouble to snip and save I'm posting it. My post got lost in cyber space during the timewrap! 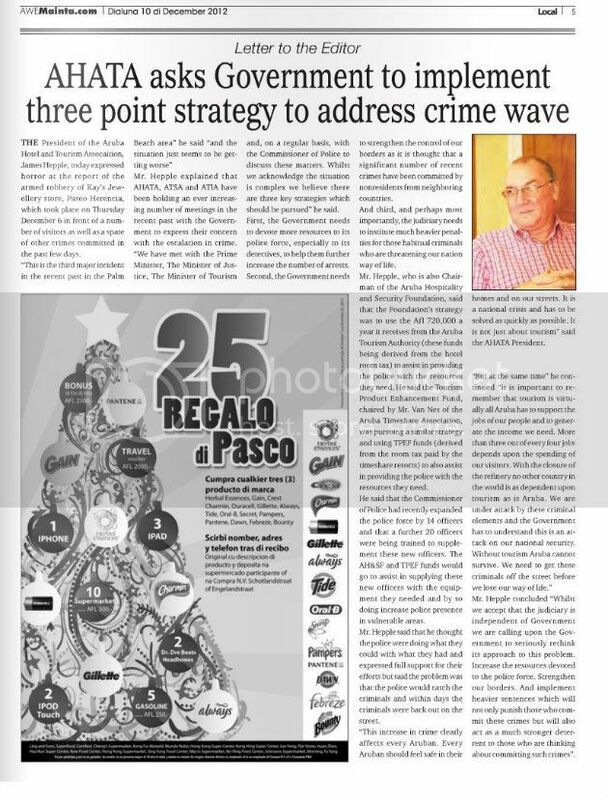 Neither he nor Aruba will last long if the economy and crime don't improve... "Without tourism Aruba cannot survive." Joran van der Sloot has a letter to a Peruvian television station in which he admits that he sent through his lawyer tried to bribe the judges. He would have paid $ 75,000 in exchange for a low sentence. That he was not finally. Peruvian media received a long letter from Van der Sloot. Sources confirm to RTL News that the letter indeed Van der Sloot. In the letter he says that he never had a fair trial. Van der Sloot was in Peru sentenced to 28 years in prison for the murder of Stephany Flores. His former lawyer Jimenez would give him prior to the lawsuit have agreed that after five years, would be released if he would confess and $ 75,000 to the judges would give. That he has done in his own words, "because he had confidence in Jimenez '. "With open mouth in astonishment," he heard the verdict, he says in his letter. He got 28 years jail. Van der Sloot says in his letter that Jimenez him half the money wanted to return, but the Dutchman has the lawyer angrily put aside. Van der Sloot says he has received $ 75,000 from the American Mary Hamer, who helps him. They would have copies that must prove that the money actually paid to Jimenez. Van der Sloot is that he never had a fair trial. He wants the case re-done. He says in the letter that "the downside for the parents and friends of Stephany is that the matter will receive renewed attention. On the other hand, according to Van der Sloot finally get clarity. "That would be able to heal their wounds. I've never been able to explain what exactly happened that day and why. I have been in the process never asked a question." In the letter, Van der Sloot also that he has even contemplated suicide. He was given the opportunity to do so on a silver platter handed. He never had a chance to explain what happened and why? Yea right - just like he never had a chance to explain what happened to Natalee, either. What a liar - he wouldn't know the truth on anything. Just a liar and a murderer. Just trying to lie, cheat and steal his way out of trouble again. Daddy just didn't give him the final lesson on that, now did he?